A superb selection of some of the finest unpasteurised cheeses from England. Finn 200g - Soft, double cream texture. Lactic and creamy when young with walnut and mushroom flavours as it matures. Stichelton 250g - A traditional blue cheese made in Nottinghamshire to a Stilton recipe, but using unpasteurised cows milk. Berkswell 250g - A hard ewes milk cheese with a distinctive rind and lively intense flavours that vary with the season of production. Original Cracker 100g - A plain, savoury cracker with a satisfying snap to accompany any style of cheese. These crackers are a real all-rounder. 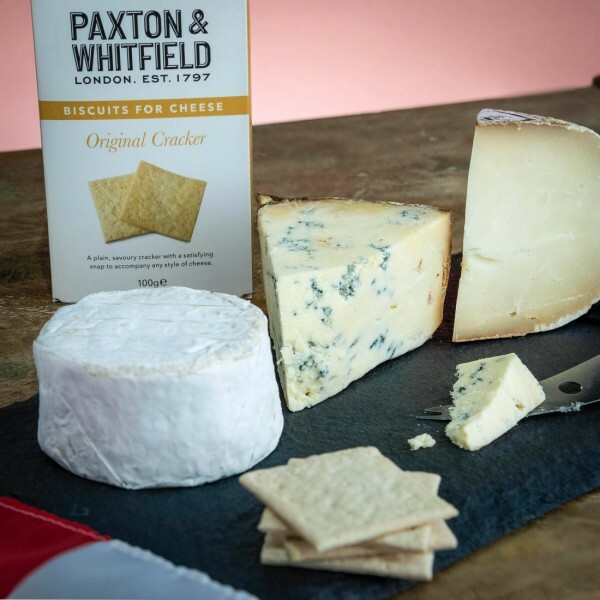 Their mellow flavour complements stronger partners such as Cashel Blue, while their satisfying snap lends itself well to buttery cheeses such as Brie de Meaux and Rollright. Made by Charlie Westhead from Neal's Yard Creamery which moved from The South East in1996 to the beautiful location on Dorstone Hill, overlooking the River Wye in Herefordshire.